planet manners: Long Island, NY: Victory for Deer and Amazing Rally for Lions and Elephants! 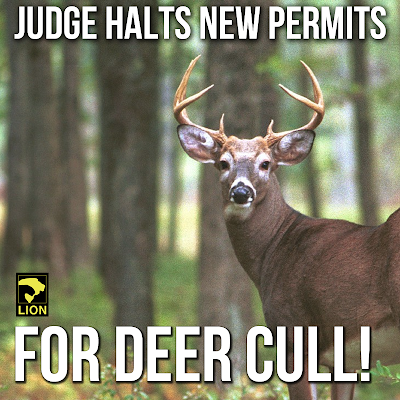 Long Island, NY: Victory for Deer and Amazing Rally for Lions and Elephants! Updates: Victory for Deer and Amazing Rally for Lions and Elephants! until the end of March, when another court hearing is scheduled! "Opponents of the cull argued in court that the DEC should have done an environmental study before issuing the permits. our Donate for Deer event. With YOUR help, we WILL stop this cull! Last night was the largest circus demo we've ever had at the Coliseum, and the least visitors we've ever seen attend! Thank you to all who've come out. There are more dates ahead so please help us keep the pressure on as lions, tigers, and elephants still need your help too! Help us create a more humane Long Island.